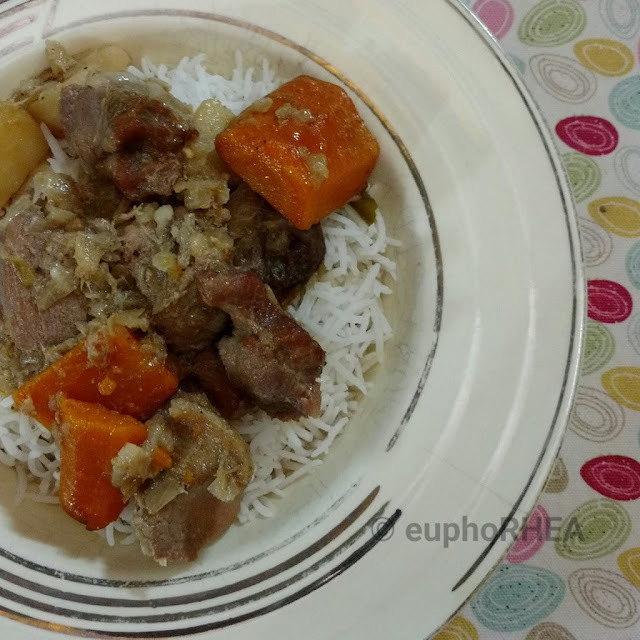 Soupy Pork Stew is perfect for nippy winter evenings in Kharghar where the temperatures don't freeze your bones but there's still a nice chill in the air and a hot soupy meal is very welcome. It's a basic no fuss recipe and something that I like make as often as possible, after all it tastes great and is easy to put together - what's not to like?! Wash the pork and marinate with salt and ginger garlic paste. Use a little less salt because the bacon fat that's used later will be salty. Cut the potatoes and carrots into large chunks. Heat oil in your pressure cooker and fry the carrots and potatoes till the edges turn brown. Remove to a plate and set aside. In the same oil drop in the whole spices, fry for half a minute, and the throw in the chopped onions. When the onions turn translucent throw in the green chillies. Use more chillies if you want the stew to have a lot of heat. After a few minutes when the onions begin to pink add the pork pieces to the pot. Stir well and braise the meat for 10 minutes at least. Grind fresh pepper directly into the pot. Mix. Add the bacon fat and stir again. Let it cook for another five minutes. Now put in the potatoes and carrots. Add just enough water to cover the pork and shut the cooker. Let it come to pressure and then reduce the heat. Let it cook under pressure for 10 minutes. Then switch off the heat and let the cooker cool on its own. Check salt and adjust if required. Serve hot with plain rice, pav or sliced bread.